The exclusive jurisdiction of the flag state is not absolute. There are several exceptions by which other states are granted in varying degrees a share of legislative or enforcement jurisdiction with the flag state. This sharing of jurisdiction is related in four cases to offences and in two cases to the nationality of vessels. These provisions are not derived from a common structure, although some of them are of ancient origin. Only two basic principles in these provisions find some general application. One is that the states are required to co-operate in the repression of the offences of piracy, illicit drug trade, and unauthorized broadcasting; co-operation is not, on the other hand, expected for the prevention of transport of slaves. Secondly, warships and other vessels and aircraft clearly on government service have a right of visit on foreign vessels suspected of involvement in piracy, the slave trade, or unauthorized broadcasting. 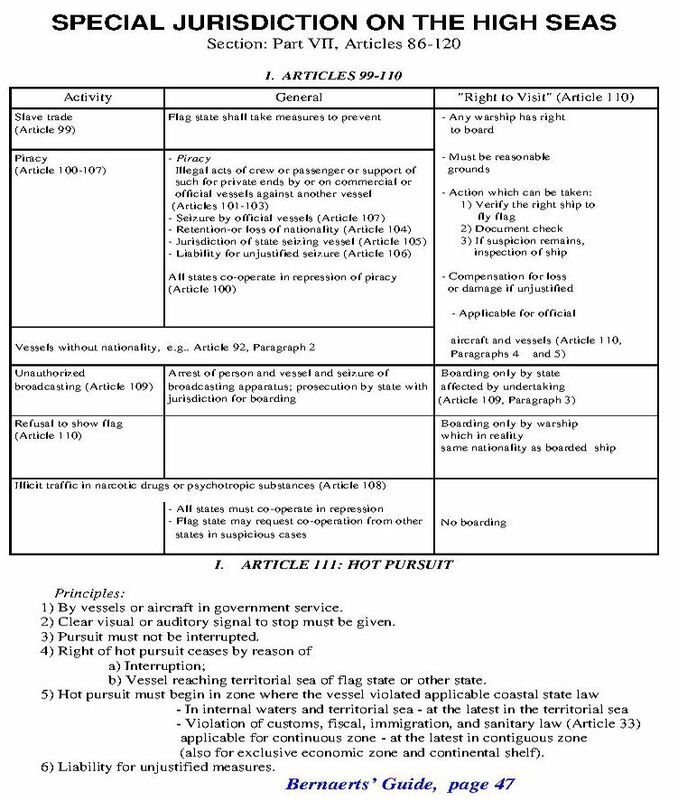 Government vessels also have a right of visit on vessels without nationality (important in the case of vessels which sail under the flags of two or more states) and on vessels of apparently the same nationality as the government ship, even though flying a different flag or refusing to show any flag at all, in reality a question of flag state jurisdiction. In the case of ships involved in illicit drug trade, the jurisdiction of the flag state remains in this respect unchallenged. But the flag state may request co-operation from another state, including the conducting of a visit on board. The jurisdiction of other states on foreign vessels as granted in the right to visit by duly authorized government vessels is limited to cases of suspicion of certain activities (piracy, slave trade, unauthorized broadcasting, sailing without nationality, practicing deception with regard to nationality); the boarding vessel may verify the right of the ship to fly the flag by checking its documents and, if suspicion remains, proceed to a further investigation. Only in cases of piracy and unauthorized broadcasting are the rights of other states considerably extended. It is significant that the definition of piracy presumes the involvement of at least two vessels, a pirate vessel and a victim vessel, thus excluding hijacking as it has been practiced in recent years from being treated as piracy. Piracy is the only case in which every state's official vessels may carry out a seizure and the state exercises full jurisdiction with regard to penalties to be imposed and action to be taken. Actions of arrest and seizure due to unauthorized broadcasting, on the other hand, may be carried out only by states affected by unlawful broadcasting. The right of hot pursuit has developed of itself. It allows an official vessel to extend the sovereignty of the coastal state beyond the territorial sea by maintaining an uninterrupted chase of a fleeing merchant vessel. The pursuing vessel must be authorized to make arrests. Hot pursuit may commence when the coastal state has good reason to believe that the foreign vessel has violated the state's laws and regulations and the vessel has disobeyed a clear order to stop. The chase must begin within the limits of the territorial sea or, where relevant rights have been violated, in zones further out. The right of hot pursuit ceases when the chase is interrupted or the vessel reaches the territorial sea of its own state or a third state.